Why can’t you overlook hard hats in a general construction safety plan? When it comes to ensuring general construction safety, many forms of personal protective equipment, or PPE, must be factored into the plan. While it is important to protect a worker’s hearing, breathing, eyes, and hands, it is equally important to protect their head, if not more so. 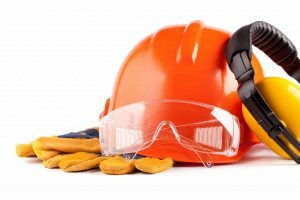 Here are some major reasons why the significance of hard hats can’t be overlooked when crafting a plan for general construction safety. Preventing head injuries is one of the primary functions of a hard hat. Hard hats are meant to protect the wearer against anything that might fall on them and can also reduce the impact of bumping into something and hurting their heads. Hard hats are similar to helmets worn by athletes in many contact sports, particularly in how the hard hat redirects any impact to the head. While a direct hit can be extremely harmful, the hard hat should spread the shock over a larger area, minimizing any potential damage. Hard hats are also useful for protecting other parts of the upper body. The face, head, neck, scalp, and shoulders can be guarded against liquid splashes or spills. Whichever type of hard hat is used, it should fit its user well, and be used with other pieces of PPE as well. The human body always tries to find the most efficient way to ventilate heat and release sweat. Unfortunately, this often means that the head will get the worst of it. Hard hats and other pieces of headgear can only make the head warmer, which can lead to the worker overheating. Although the end of summer is fast approaching, Maryland is known for remaining hot well into the fall. Hard hats with built-in sweat protection can provide a cooling solution that reduces the amount of sweat pooling on the worker’s head and neck as well as easing pressure on their skull. Everyone who steps onto a construction zone – whether they are ordinary workers, construction managers, or visitors, must wear a hard hat. As demonstrated above, hard hats can make anyone who wears one feel safer and more comfortable. When your workers and employees feel more comfortable, they will also be more productive. In the end, better productivity will benefit everyone involved. G&M Services is proud of our employees and the dedication they have for safety in the workplace. Our employees are also rewarded for positive safety practices. We incorporate weekly and monthly discussions and meeting to ensure that all involved are aware of how to handle equipment and potential situations that could occur during a project. G&M Services offers services in the way of concrete drilling and sawing, concrete scanning and FireStop. To get started with us, call today at 410-787-8828 or visit our contact page. Follow the official company page today on Google+, Facebook, Twitter and LinkedIn. This entry was posted on Thursday, August 24th, 2017	at 6:59 pm	. Both comments and pings are currently closed.